When looking at Pakistan as a model of applied Nationalism after 44 years of existence; at what the Muslim State has or has not achieved in its short history, and at what it has or has not become we are inevitably led to ask the following question: Is this what Muhammad Iqbal dreamt of?" In view of Benazir Bhutto's being superseded by Zia's military government for the mere fact that she is a woman, in view of the emergence of the Islamic fundamentalist political party Jamaat-e-Islami and of the latter's impact on State legislation, and in view of persistent socio-economical problems, of political corruption, of an ongoing war over Kashmir, etc. we are tempted to answer negatively to the above question. On the other hand it seems that Iqbal could be qualified as an almost self-righteous fundamentalist reactionary, seeking to return to the glorious past, extoling mystical values, rejecting the rest of the world and envisioning Islam as the only hope for the future. It brings one to wonder whether or not Iqbal's ideology isn't really at the basis of this resurgence of fundamentalism in Pakistan. We believe that a closer look at Iqbal's ideology will give us a clearer understanding of his vision of Islam in the Indian subcontinent, a vision which can then be compared with today's reality. Igbal saw Islam as a salvific force for the Indian sub-continent. His search for salvation was motivated by fear, fear of a loss of identity, loss of power, loss of culture. Fear amplified by the overtaking of Muslim rule of India by the British, fear of the Hindu majority, fear of syncretism and assimilation, fear of Muslim apathy and disunity, fear of Westernization, of secularisation, of Capitalism and of Marxism. "The realization by a proud Muslim that the West is ahead of the world of Islam in almost every respect, and his inner anguish at the backwardness of his own people, compelling him to admire the achievements of the West but ' also to hate since in comparison his own world appears inferior." Iqbal's response to these perceived threats, whether real or imagined, to the survival of the Indian Muslim community was to restore vitality and meaning to the Prophet's religion, and to demonstrate its modern day relevance to the plight of Indian Muslims. This he did in the most efficacious manner possible given a Muslim, poetry! Muslims seem to be enamoured with the clever use of words, their love of language and discourse is well-demonstrated in Islamic literature. Iqbal struck a sensitive chord, using artful imagery and emotionally charged metaphors to reinspire his co-religionists with a sense of pride and with a desire for autodetermination. Iqbal's nationalism is difficult to seize, since it is an ideological nationalism not based on culture, language, regionalism, territory or ethnicity but on a shared belief. Iqbal's nationalism is also hard to seize because it seems full of contradictions. For instance, Iqbal seems to toy with the notion of pan-arabism and the "Consolidation of the World Islamic Community" yet insists on the "Indian Muslim" distinction. He affirms that Territorial Nationalism and Islam are contradictory in terms yet calls for the establishment of a Muslim State in the Punjab, Sind, Baluchistan and Northwest Province. He assures Hindus that the creation of Muslim states will not mean the introduction of religious rule, yet he does not believe in the secular state. It is possible that at the philosophical level Iqbal was capable or reconciling these differences, he was after all a philosopher, unfortunately the same could not be expected from the masses. This is why we feel that between Iqbal's sublimation of Islam, and his hazy definitions of nationalism, a vacuum was left that could either be filled by secularization or fundamentalism. This brings us to our second point: What do Iqbal and fundamentalists have in common? It is clear to most that Iqbal was not a revivalist but a modernist. The accent is often placed on the differences which distinguish, let us say, Iqbal from Maudadi. Iqbal is perceived as the emancipator, the re-energizer of Islam, moderate and progressive whereas Maudadi is perceived as the traditional Islamic scholar, radical and regressive. We fail, however, to see mach difference between Iqbal and Maudadi. While it is true that Iqbal may be somewhat more moderate and definitely more influenced by the West than Maudadi ever was, we find that both have more than less in common and that they both are, albeit at different degrees, fundamentalists. Let us examine briefly some of the tenets held by Iqbal the Modernist and the Neorevivalists. Firstly, we must admit that Iqbal is a revivalist in his own right, he seeks to restore Islam to its pristine condition, and encourages the return to religious ethics. Both suffer from some form of integralism, exclusivism, xenophobia, identification with God and carry out in their respective manners a Jihad against the West and Hinduism. They can both be described to a certain extent as Islamists, purists, believers, or devout. They both see Islam as a comprehensive way of life governing the spiritual and the temporal through a system of belief and law. To some extent they both blame the failure of the Muslim society on its departure from "the straight path´, and both fear the demons of secularization and Westernization. They believe that the renewal of Muslim society and the salvation of humankind (Asia) are dependent on Islamic religiopolitical and social reformation drawing its inspiration from the Quran. In seeking to restore God's rule, Western inspired civil codes must be replaced by Islamic law which is the only acceptable blueprint for Muslim society. Yet while Westernization is rejected, modernization is accepted when subordinated to Islamic belief. They both call on dedicated and trained individuals to set an example by joining the struggle against corruption and social injustice. Finally both agree that religion is integral to state and society. "In contrast, the failure of modernists to produce a systematic reconstruction of Islam meant that their isolated, ad hoc reforms were not seen as part of an integrated whole, but instead as the result of an eclectic borrowing from the '~ West. Therefore, modernists came to be regarded as Westernizers." Is it any wonder that neo-revivalism with its constant condemnation of Western lifestyle, its black and white vision of the world, its being able to identity the cause of all evils befalling the new State would be able to gain ground where Iqbal's Nationalism had failed? People want easy answers to hard questions, in a failing economy, in a perpetual war with India, in the division of the Muslim state not thirty years after its creation, and in the realization that Iqbal's dream is far from reality. The creation of the Muslim State, the assurance of Muslim rule over Muslims had not solved after all the problems existent when non-Muslims ruled Muslims. On the contrary it had created new problems such as political instability, loss of women's rights, introduction of military rule, loss of life in war and massacres, isolation of sub-continent Muslims in their respective territories of Bangladesh, India and Pakistan, not to mention Kashmir. Added to this was the general aloofness of other Muslim Nations with regard to Pakistan, whereas these may have been sympathetic to the Indian Muslim cause, they remained uncommitedly absent on the political scene despite Iqbal's hope for the unification of the World's Muslim Community. However Pakistan's Jamaat-e-Islami and the Egyptian Muslim Brotherhood were able to develop ties with Brotherhoods in Sudan, Syria, Jordan, Kuwait, the Pakestinian Muslims, India, Afghanistan and Kashmir. Westerners have difficulties with the notion that any given country would wilfully choose a Religious State over a Secular State especially in view of their recent emancipation. They also wonder whether there is truly room for democracy in an Islamic State, but what baffles and threatens them unequivocally is the surge of religious "intégrisme" particular to Muslim countries. Religious experience in the West is an individualized affair, at most it purports to save the moral fabric of Western civilization. In Pakistan, however, religion is not merely an individualized way of life it has become a means of day to day survival, an ultimate hope for justice and relief from oppression. Islam divides the world in two categories: Dar al-Islam (Muslim territory, "abode of peace") and Dar al-harb (non-Muslim territory, "abode of war"). By this very dichotomy we see that it is impossible to distinguish Islam from the State, or Religion from Politics. We also see that if this world view is taken literally it will be impossible for Muslims to coexist with non-Muslims, much less be ruled by them. Iqbal's desire for Muslim autonomy was probably fueled (consciously or unconsciously) by this dichotomy. That is why despite Iqbal's reticence toward Patriotism and his rejection of territorial Nationalism the Muslims of India finally ended up with a "national homeland" of their own. It appears that Muslim ideology had not prepared them for the responsibilities of statehood and all that it entails. Problems arose when came the time to ran the Affairs of state with the Sharia as sole basis of law. It seems inconceivable that the parents of a long desired infant should be totally unprepared for its birth, however that appears to be the case with Pakistan. We must nevertheless admire the "guts" of the Pakistanis, who only decades before were apathetic Muslims. Now they were ready to get into the Nationalistic train even though they weren't sure where it would lead them, going somewhere was better than stagnation, no matter the price. "Although Iqbal is concerned with polity and society and propounds ideal solutions, he does not concern himself with details: he offers no specific scheme pertaining to the socio-economic structure and the political system he would like established." We feel that the lacunae in Iqbal's ideology particularly with regard to statehood and Nationalism are partly responsible for the political chaos that greeted the new State. We feel that it is this chaos that provided favourable ground for the emergence of fundamentalistic elements as a political power in Pakistan. We do not mean to directly or indirectly blame Iqbal for Pakistan's political shortcomings. Had Iqbal lived to see the birth of Pakistan things might have been different. We are aware however that Iqbal could not and would not provide room in his ideology for State rules or political guidelines, since he merely wished for the recognition of Muslims as a distinct society within India and for their access to auto-determination. 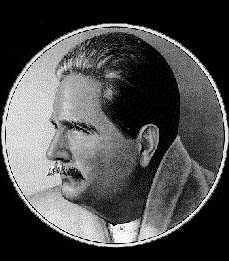 Pakistan was not Iqbal's dream, and whereas he was a great ideologist, he definitely was less of a politician. What Iqbal did do, was put Indian Muslims in touch with their souls and with their religion. We conclude in saying that the actual emergence of Islamic Fundamentalism is consequential to the void found between Iqbal's ideological discourse and the Pakistani political reality. It is also our feeling that when the Modernist and Neo-revivalistic trends have been fully exploited, both systems will have failed to lead Pakistan to a political and economical recovery. Pakistan can ill afford to continue its existence in isolation of the Western world. Furthermore, whereas religion has played a prominent role in the motivation and preservation of the Pakistani nationalistic fervour, it has been unable to solve the problems raised by poverty, hanger, illiteracy, over-population, health, environment, natural disasters and war. These basic problems were the cause for the Islamic revolution in the first place. If the Government spends all its energy policing the segregation of the sexes, engaging in theological debates, or waging war with India, other ideologists will come along with other dreams for other reforms. Before Pakistan can show the world the superiority of Islam as "an ideological basis for reconstruction of the world social order" it needs to do some reconstructing, if you'll pardon the expression, in its own backyard. Before it can claim to be a Muslim State based on unity, equality, moral and social justice it needs to improve its treatment of women and minorities. This is the challenge facing Pakistan today if Islam is to survive as a socio-political system and not just an individual faith. Esposito, John L. Islam: The Straight Path. Oxford University Press, New York - Oxford, 1988. Mumtaz, Khawer & Shaheed, Farida. Women of Pakistan. Zed Books Ltd., London and New Jersey, 1987. Naim, C.M. Igbal Jinnah and Pakistan: The Vision and the Reality. Maxwell School of Citizenship and Public Affairs, Syracuse University, 1979.